Portchester train station has not been successful in securing Access for All funding. Several residents wrote to the MP about issues with wheelchair and pushchair access in September last year. Suella Braverman MP supported the bid for both stations to gain Access for All funding, money granted from the Department of Transport for access improvements to stations. Mrs Braverman said the decision would mean ‘it is almost impossible’ for some disabled people to use the station. She said: 'The lack of proper access at these stations is a real concern, making it almost impossible for those with mobility difficulties to use the service the rest of us take for granted. ‘It’s a real inconvenience to a significant number of people, and it needs to be sorted. This means there remains no step free access for passengers to Portsmouth from Swanwick station and for passengers to Southampton from Portchester. 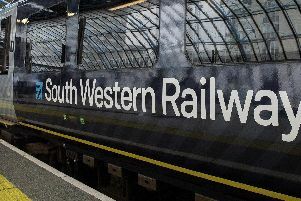 A representative from South Western Railways, which manages the two stations, said: ‘For step-free access, customers are advised to travel to Fareham and Cosham. ‘Portsmouth Harbour, Portsmouth & Southsea, and Cosham have step free access to all platforms. ‘Havant, Fareham, and Fratton station were all previous recipients of Access for All funding in previous rounds. The Access for All programme has created step-free, accessible routes at more than 200 stations across the UK.